This is a lesson I did with kids from 6 to 10, and it has worked every time. They asked to did it several times. I call it "feeling just like a painter" because I invented it with that objective in mind: make them experience the sensations of being a painter. Mix sand into the paint, enough sand so it will be quite thick but still creamy... Now that's why they need sturdy brushes: the sand tends to "eat" the brushes..
Give each kid a mat or a cardboard rectangle (bigger then A4 (210 × 297 mm) if possible) and let them paint away! They have to paint all the area of their painting, they cannot leave any area unpainted. Some kids didn't feel comfortable painting without drawing first, so I let the draw a little with a pencil and then paint. But explain that they have to draw big, because the brushes are big. First grade students created a simple abstract/non-objective painting using geometric and organic shapes (one student had an abstract birthday cake with candles). Color pallet was kept simple (using mainly primary colors). Students brainstormed a list of words that were important to them. Each table had a recorder and a speaker. The recorder wrote down the words (pick your best spellers for this) and the speaker read the list to the class. Mix 5 cups water, 2 cups white flour, ½ cup sugar, and 3 Tablespoons salt. Pour into saucepan and cook over medium heat until thick and bubbling (about 7 minutes) Cool well. This can be stored in the refrigerator in covered containers for several weeks. Spoon cooled "pudding" into containers and mix with 1/8 to ¼ cup powdered or liquid tempera paint. Use a craft stick or palette knife to apply. Use heavy Tag board or cardboard, as it will curl. Maybe try on corrugated cardboard (recycled) for extra strength. Giotto's Tower in Florence, Italy. Click on the image for full size. Giotto's (GEE-O-TO) paints were made from egg yolks mixed with clay, minerals, berries, or even ground insects to make colored pigments. Giotto di Bondone - When Giotto was a young boy tending sheep in the mountains of northern Italy, he drew pictures to help pass the time. A traveling artist discovered Giotto's drawings and offered him an apprenticeship. There Giotto learned how to make paintbrushes and art tools, which minerals could be used to create different colors of paint, and worked on drawings and small parts of paintings. Eventually Giotto left to find work on his own. He became the chief master of cathedral building and public art in Florence, Italy. Giotto is best known for painting people who appeared three-dimensional rather than flat. Many paintings of Giotto's time were made with egg tempera paint on special panels of wood. There were no art stores, so each artist had to make paint by grinding minerals, clay, berries, or even insects into fine powder and mixing this pigment with egg yolk and water. Egg Tempera makes a thin, fast drying coat of bright color. The paint is very strong and long lasting. Giotto's beautiful egg tempera paintings are over 700 years old! Young artists explore Giotto's technique of painting with egg tempera with a homemade recipe made with crushed chalk or powdered tempera. Break off small pieces of colored chalk and grind them into powder in an old bowl with a round rock. NOTE: Avoid breathing the chalk powder. OR use powdered tempera. Put the colored powders into the cups of a muffin tin, egg carton or paint palette. Crack the egg and separate the yellow yoke from the clear egg white. Put the yolk in a clean bowl and mix it with 2 teaspoons of water. Whip it with a fork until the mixture is froth yellow. Add spoons of egg-water to the powdered chalk and stir with a paintbrush until you make a smooth, runny paint. Now use the egg tempera paint to make a painting! 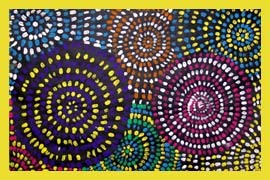 An idea that the students always love is a symmetrical painting using tempera. Cut the 12 x 18 (30.5 x 46 cm) sheets of newsprint into strips 6" x 18" (15 x 46 cm) and have the students create a design on them. (Combine curved line with straight line/geometric shapes). My students are required to show me 3 before they can choose the best one. Trace the design with marker or pen, then turn over the strip of paper and trace again (you can usually see the lines through the newsprint). Place the strip under ½ of the full sheet of white paper and trace the design. Then flip the strip of newsprint like a page in a book and trace on the other ½ of the white paper so the design is symmetrical. Once the design is on the paper, my students paint the symmetrical design but they have to mix every color they use. They cannot use pure color out of the bottle. They love the results! And many ooooh and aaaaah over the colors they create. Use color to create a center of interest. I do these with my 7th graders but could easily be adapted to other grade levels. 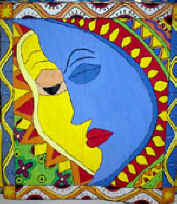 See more examples on my website: http://cmsart.wix.com/art - Click on 7th grade gallery, then symmetrical paintings. High School example - adaptable to lower grades. Students use tempera to paint in flat areas of color. Dots are painted over to add dimension and shading. Complimentary pairs of colors are the lesson being used. Ken's student used fruits and vegetables from life. Negative space was painted with choice of colors. Students select an object or objects for study. They focus on interesting parts of the object/objects and create an abstracted composition. Sketches on newsprint are combined and traced onto Rail Road board. The painting is rendered a range of values - using all one color - all grays - or gray scale with monochromatic color accent (or visa versa). Musical instruments were a popular theme - along with bicycle parts. 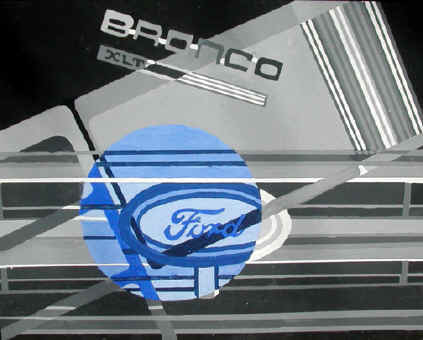 I liked this Ford theme. Last year at the Florida State Art Conference we went to a workshop on lawn painting. The research for the best product that wouldn't harm the lawn was done by the Florida State University School. They found that tempera powder mixed with flour would work. We collected everybody's extra tempera all year. We had the staff and students bring in flour. The flour weighs the Tempera Paint down and extends it. You can mix quite a bit of flour with the tempera without it changing the color. You just have to experiment to get the right mix. 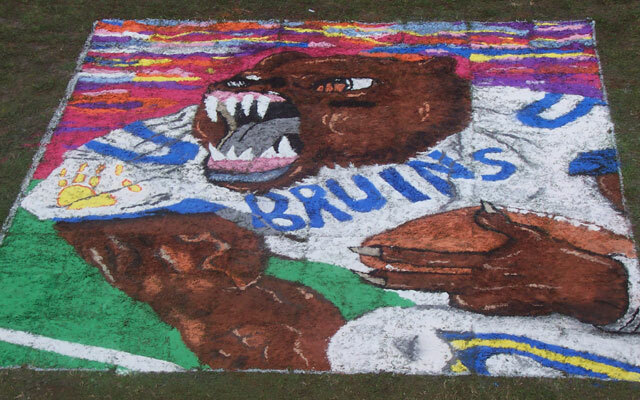 Students drew pictures of our mascot, a bruin. The best one was chosen, scanned, printed and gridded. The math classes determined how much paint would be needed for each square and laid out the grid on the lawn. (16x20 feet / 4.8 x 6.1 meters). Students were given 2 inch (5 cm) squares from the picture to paint into the 2 foot (61 cm) squares on the lawn. We saved a square for the principal. It even made the local paper. The process took most of the school day. The kids and all the teachers had a ball. It really brought art into the spotlight and was perfect for a crazy homecoming week. We did Lawn Painting last year (Mona Lisa , The Scream , American Gothic ) just before the students had to choose classes for this school year. What a recruiting event! We were outside working all day with our various classes, filling the courtyard with art. Along with the lawn painting, we also had a group of kids painting enlarged masterpieces on the sidewalk. It was a wonderful day! The administration loved it because it was integrating art with other subject areas and teaching the kids proportion and graphing skills. We'll be doing it again, once each semester, so that more kids get involved. To get the flour, last year, we had each student bring in 2- 5lb (1 - 3 kg) bags. We had enough left so that this year, each student only had to bring in one bag. Note from Judy: Surplus flour can always be used for paper maché paste. Students studied art of India. They were attracted to the Madhubani folk art paintings. Women paint on walls and on handmade bark paper. Grace's student worked in groups to paint large paintings on roll paper. Younger students could work on the natural brownish Kraft Paper leaving the color of the paper showing in areas. Another idea would be to paint on handmade paper (recycling brown grocery bags - with some Abaca Pulp added). An easier lesson would be to paint on tan Construction Paper or brown paper bags. Students learned about the Madhubani Painters of India. The Madhubani Painters are women from the Mathil region of India. They originally painted images of mythical gods on the walls of their homes as a way to decorate for celebrations. One day a horrible drought hit India and the people of Mathil were forced to find other means of feeding the family. Some tourists who saw their paintings on the walls suggested they start painting on paper, and soon the paintings became very popular among tourists. Today mothers teach their daughters to paint and they create some of the most beautiful works of art that are handed down from generation to generation. Grace required students to create individual sketches in their sketch books. They were to include the same characteristics as the Madhubani paintings that we saw, such as use of a border pattern, a central figure, and leaving very little open space. Since these paintings are very large like murals, students work in groups rather than create individual paintings. Each student submitted his/her sketch to their group, and they decided which one to actually paint. Egg Tempera - Painting of the Renaissance lesson plan from Renaissance Connection. Egg Tempera Painting: "Poor Man's Africa" (Archive) - Middle school lesson - appreciation of work of Ellis Wilson and Jacob Lawrence. About the documentary. (Archive) See more lessons on KET. 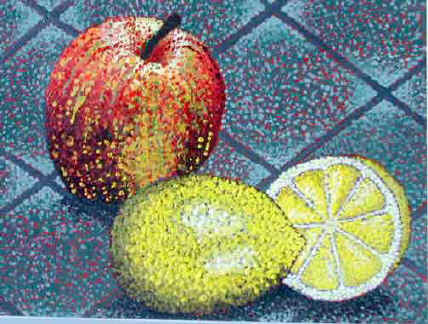 Hans Hoffman Lesson: Modern Art Styles PBS lesson good for high school. Comparing works of Hans Hoffman, Red Groom, Stuart Davis and Frank Stella. Claude Monet Lesson - from Albright Knox This lesson can be used with tempera - adaptable to many grade levels. Matisse Interiors Painting - two part lesson using crayon resist then tempera paint. sixth grade lesson adaptable to elementary. See news on Matisse. Tints and Shades - Pablo Picasso Use with image shown - or use Blue Period and/or Rose periods. Optional: in Monochromatic color plan. More lessons from Silicon Valley Art Museum. 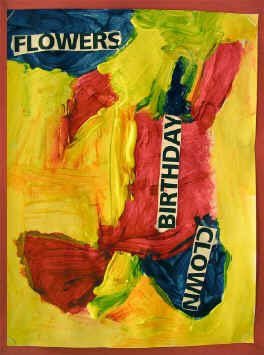 Tempera Painting a la Andy Warhol - by Denise Pannell - Elementary through middle school on IAD. Abstract Architecture Painting - High school lesson for tempera or acrylic. Many more lessons use tempera. Enter tempera lesson and level you want in the Google search and see how many lessons come up for you.